The first time I saw a Malabrigo yarn, I fell in love. It was the worsted weight merino in so many striated, luscious colors, and I bought a reddish orange for a heavily cabled sweater to wear in the winter while I served as a Peace Corps volunteer in Jordan. When I returned home, I discovered that it came in lace weight as well! This gave me a perfect excuse to create a lace shawl that showed it off. My swatch was so gorgeous just in stockinette stitch that I decided to come up with my own lace pattern that would include enough stockinette to display the yarn while still having an engaging lace pattern. I drew this out as circles and lines on graph paper and was surprised to see the big and little hexagons that emerged. Knitting with this yarn is a constant delight, and the resulting fabric is so light, lovely, and soft that this shawl quickly became my favorite. sk2p: Sl 1, k2tog, pass slipped st over. 2 sts decreased. 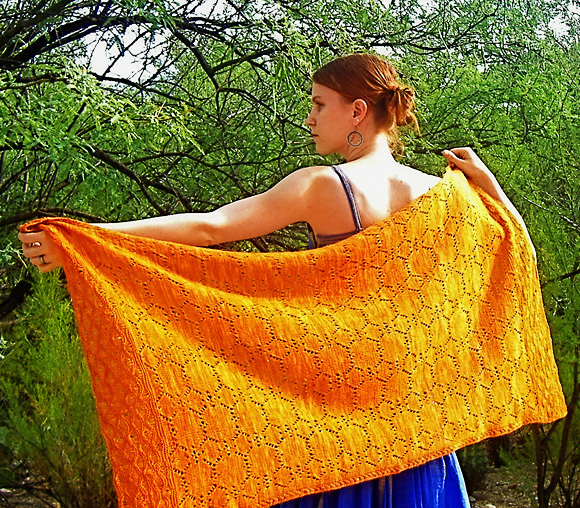 The seafoam lace pattern at the ends of the shawl has a slightly larger stitch gauge than the hexagon lace pattern, which gives the ends a slightly flared look. The seafoam pattern is taken from Barbara Walker’s Second Treasury of Knitting Patterns. In Rows 3 and 7 of the Seafoam Pattern, multiple yarnovers are worked. They do not count as increased sts, as they are dropped when working Rows 4 and 8. They form the elongated stitches that cause the rippling effect of the stitch pattern. Rows 1-2: K all sts. Row 3 [RS]: K6, [(yo) twice, k1, (yo) 3 times, k1, (yo) 4 times, k1, (yo) 3 times, k1, (yo) twice, k6] to end. Row 4 [WS]: K all sts, dropping all (yo)s from needle. Rows 5-6: K all sts. Row 7 [RS]: K1, [(yo) twice, k1, (yo) 3 times, k1, (yo) 4 times, k1, (yo) 3 times, k1, (yo) twice, k6] to end, working (k1) at end of last repeat instead of (k6). Row 8 [WS]: K all sts, dropping all (yo)s from needle. Repeat Rows 1-8 for Seafoam Pattern. Chart: Click here to see the chart; it will print on a single letter-sized page by itself. CO 166 sts. Work Rows 1-8 of Seafoam Pattern twice, then work Rows 1-6 once more. Next Row [RS]: K83, m1, k83. 167 sts. Work Rows 1-24 of chart pattern thirteen times, then work Rows 1-14 once more. Outlined pattern repeat is worked six times in each row. Next Row [RS]: K83, k2tog, k82. 166 sts. Work Rows 1-8 of Seafoam Pattern twice, then work Rows 1-6 once more. Weave in ends and block shawl. 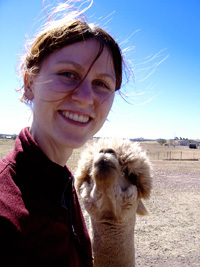 Andrea Rangel loves the functional and artistic nature of fiber arts. For her, knitting creates a connection with the past and an outlet for self-expression. Having lived in many climates, she enjoys matching the perfect natural fibers to each project and season. She is constantly influenced by the natural world and interprets her outdoor experiences through design. See more of her designs on her website at or visit her on Ravelry where her user name is andreakr.